Picasso was that rare thing in history, an artist of cultic presence, a secular manifestation of the spirit, a genuinely commanding phenomenon. 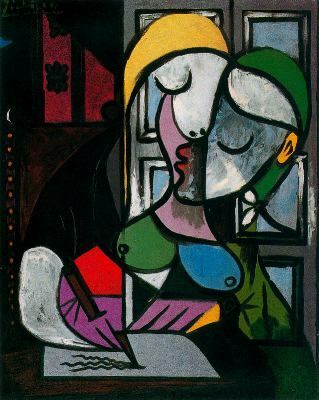 Picasso's name and work are synonymous with 20th-century art. They are the very definition of our era's artistic endeavour. This was already the case in his own lifetime; and by now he has long since become a myth, a legend for the age of mass media. Because this is so, Picasso's image as artist is one of infinite diversity. Many were those who played a part in his life, and many were those who left records. The abundance of documents relating to his life and work, and above all Picasso's own statements, permit us access to his art.' And yet the vast quantity of biographical material is a mere drop compared with the ocean of analyses, critiques, studies and theses concerning his work that has been pouring steadily out for decades. As in the case of other artists, commentaries and exhibition notes accompanied his work from the outset. But as awareness of Picasso's distinctive importance grew, so too did the tidal wave of published statements on his work. Nowadays it is no longer unusual for an entire museum to be devoted to the work of a major artist. 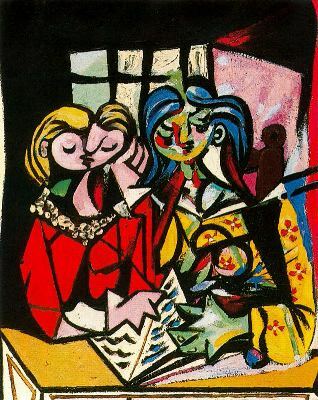 But three are devoted to Picasso's: in Antibes, in Barcelona, and in Paris. And the first two of these were created during the artist's lifetime. 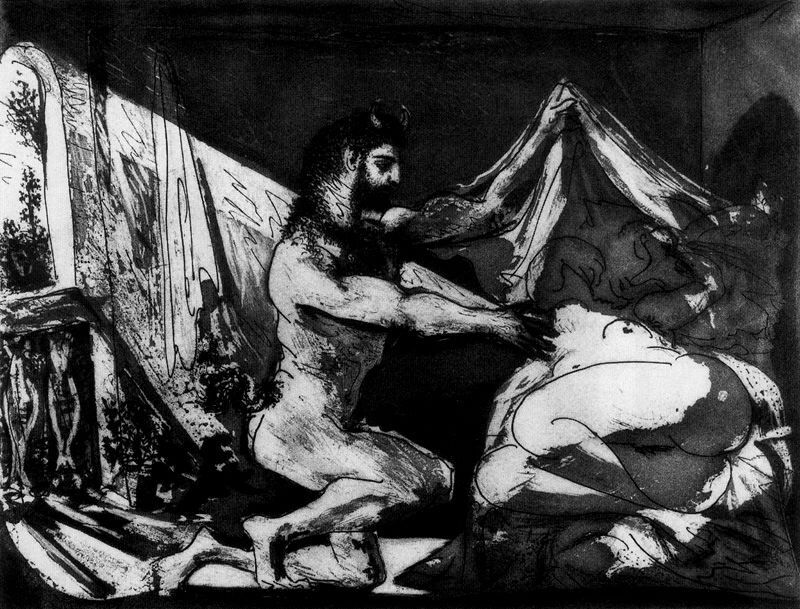 Picasso was not only significant and famous, he was also popular in the extreme -because his work seemed the very epitome of what people thought was modern in the visual arts. On the one hand, he turned his back on tradition and deconstructed images of natural form. On the other hand, he deliberately and randomly shifted the goalposts of visual creation. 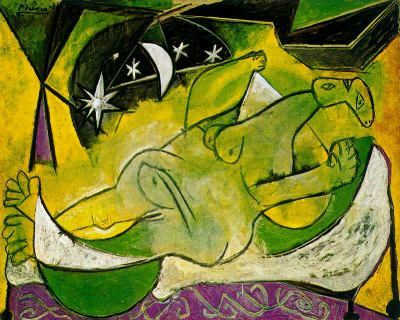 In a word, the bizarrely denatured forms that are characteristic of modern art are fully present in Picasso's work. This has come to mean that Picasso's creations are not merely part of the sum total of 20th-century art, but rather are seen as its icons. "Guernica", for instance, is unquestionably the most famous modern painting, worldwide, matched as an art classic only by works such as Leonardo's "Mona Lisa" or Rembrandt's "Night Watch". 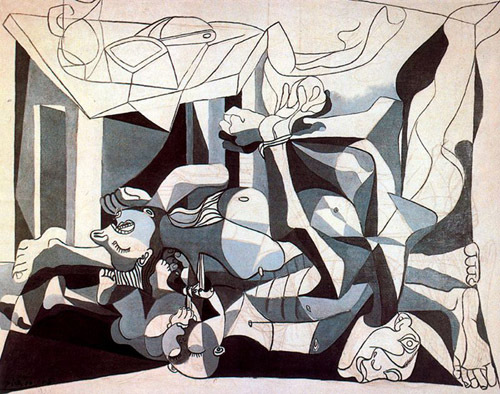 The bombing of Guernica, thanks to Picasso, came to define the horror of modern war, the inhumanity of man to his fellow man. And, uniquely in modern art, "Guernica" has exerted a quite remarkable influence on younger artists such as the American pop artist Peter Saul or the political artists of the Spanish group "Equipo Cronica" Their new versions and reworkings show how a single work can provide the matrix in which a sense of the "Zeitgeist" is popularly expressed. Thus in the early 1950s the portraits Picasso painted of a young girl, Sylvette David, transformed the innocent pony-tail, the teenage girl's hair-style of the day, into the very emblem of an epoch. Not till Andy Warhol did his serigraphs of the famous (Marilyn Monroe, J. F. Kennedy, or Elvis Presley) were artworks again to make such an impact. No other 20th-century artist achieved Picasso's astounding omnipresence, not merely through his art but in his own right. 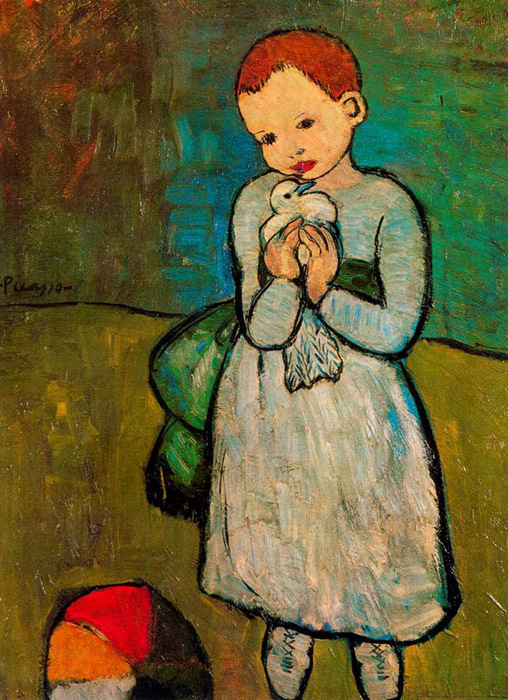 The early painting "Child Holding a Dove" is a two-dimensional, stylized childish pose; but once the image was reproduced in millions it came to stand for naive grace and innocence. Indeed, it became so familiar that it (and its creator) entered the colourful world of comics. And when the French film director Frangois Truffaut made his classic "Jules et Jim" in 1961, it was Picasso's pictures he chose as aptest to signal the cultural habitat of the European intellectual before the Second World War. 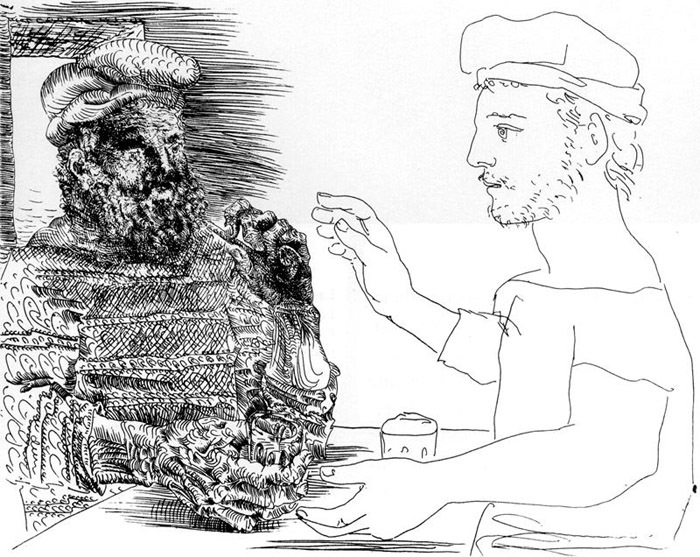 Significant sequences in the film show Picasso reproductions behind the protagonists. If Picasso's work acquired this kind of emblematic function, so too did the artist himself, as far as his contemporaries were concerned. It was only to be expected, then, that just a few years after his death he would be made the titular hero of a satirical film about artistic and political trends in the 20th century, "The Adventures of Picasso." Precisely because Picasso was equated with modern art per se, all the extremes of public responses were unloaded upon him, at every stage in his career. 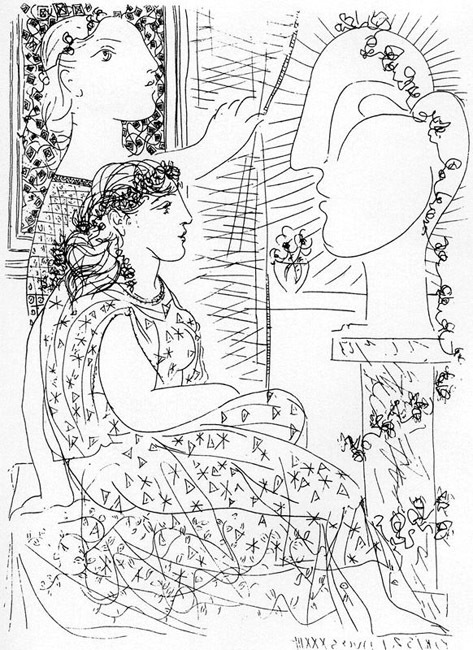 When the National Gallery in London organized the first major post-war Picasso show in England, one newspaper described him as a great artist, a poet, a genius whose creations were inspired by the profoundest of dreams, while another damned his art as the work of the devil, dismissed piggy-nosed portraits as the imaginings of a schizophrenic, and declared that such work should not be publicly exhibited in England. Both extremes are the product of cliches and widely shared preconceptions. Inevitably the dismissal reminds us of the abuse the Nazis heaped on art they considered "degenerate". Equally, though, the praise is nothing but petty phrase-mongering, and tells us nothing of Picasso's success in realizing his intentions, or of his sheer skill. Though these views appear irreconcilable, there is less of a polarity than we might first think; in fact, they share a certain common ground. If the foes of modern art condemn it as the work of lunatics and would ban it if they had a say in the matter, its enthusiastic advocates emphasize what seems inspired and supposedly irrational, inaccessible to cool reason; and in both cases something beyond the everyday experience of the senses is taken to be the final source of creativity. 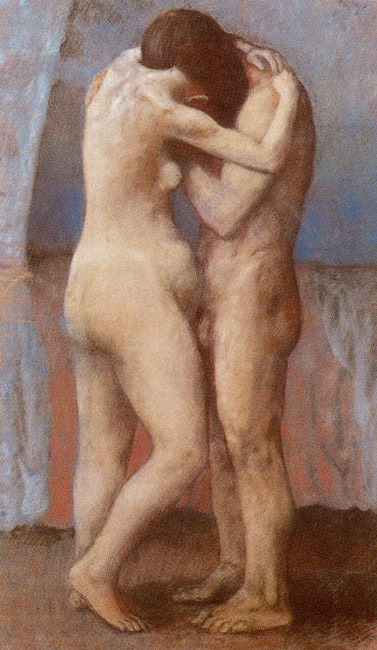 At a very early stage, Picasso haters and lovers alike saw his talent as something demonic. One American critic called him the "devil incarnate" in 1910; and the "New York Times", generally a restrained and proper paper, gnashed that he was the very devil and that his audacity was breathtaking, when his first American exhibition was held in Alfred Stieglitz's Photo Secession Gallery in New York in 1911. Not many years later, German critics (and not even the worst) were busy perpetuating the usual equation of visual deconstruction with insanity, viewing Picasso himself as a neurotic and pithily announcing: "People are no longer locked away in asylums. Nowadays they found Cubism." This is how legends are made; and, to this day, Picasso seems more the stuff of myth than a flesh-and-blood historical person. He himself, of course, must share the blame. Many who knew him in the early days in Paris were quick to detect the artistic energy, creative depth and autonomous will of his art in the artist too. 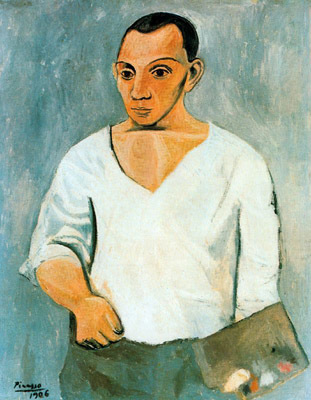 Picasso was a striking person, a stocky, robust Spaniard who invariably made an impression. He was all charisma and self-confidence. With his hair tumbling across his forehead and his intense gaze, his attitude became a pose. 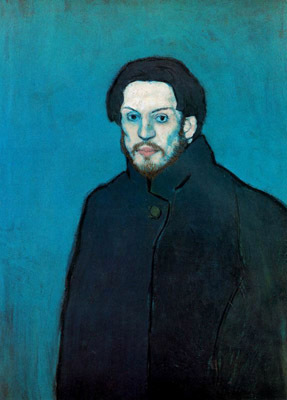 Everyone who photographed Picasso stressed his demonic side,"' and in doing so, of course, merely repeated what he had proclaimed to be the case: for it was a demonic Picasso who appeared in a number of early self-portraits. From the outset, fellow-painters and critics and collectors saw Picasso in ways he himself dictated. This has remained the case to the present day. Picasso's personal appearance, his style of life, his wilfulness, and his relations with women (attesting his vitality in the eyes of many), have provided irresistible media bait. In 1955, Georges Clouzot made a lengthy documentary of the artist at work, and the journalists had a field day celebrating Picasso as a kind of superman: "Summer 1955, and the cameras are rolling in the Victorine studios at Nice . . . Picasso, in shorts and bare to the waist, his torso tanned, his feet in slippers, strides into the bright daylight: a living bronze god come down off his pedestal, mighty, majestic, he belongs to all ages, to primitive cultures and to future times light years away. Depending on how the light falls on his head, his powerful chest or his sturdy legs, he can look like a witch doctor or a Roman emperor. The unintentional humour of comparisons such as these nicely illustrates the image of Picasso that was then widely taken for granted. 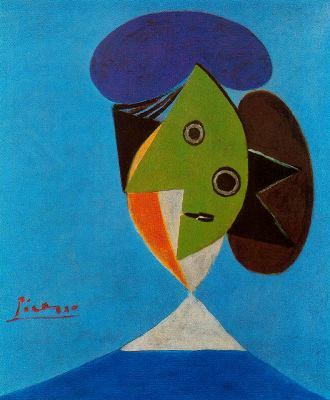 At a time when most people were glad if they could draw their pensions in peace and quiet, a Picasso rampant wearing a sporty turtle-neck jumper or beach clothes or in pugilist pose, stripped to the waist, was a conspicuous, dynamic exception to the rule. they too are incomplete. For decades, major shows throughout the world have not only presented Picasso's work to an amazed public but have also laid the foundation of an understanding of his art." 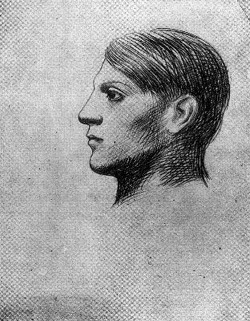 Born on 2.0 October 1881 in Malaga, the son of a painter and art teacher, Picasso started to draw and paint at the age of nine. His father guided him, and later he was professionally trained at Corunna, Barcelona and Madrid. At the age of fifteen he was already successfully taking part in exhibitions. 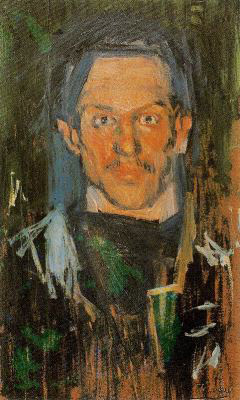 In 1898, disappointed by academic teachings, he gave up his studies and set about making a name for himself in artistic circles in Barcelona, and then in Paris. 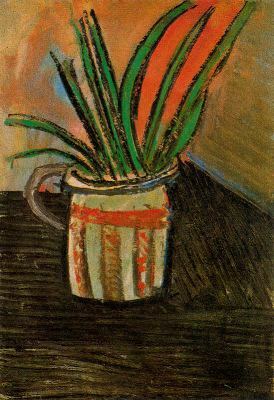 By 1901 he had a Paris show in the Galerie Vollard almost to himself, sharing it with another Basque; he sold 15 of his 65 paintings and drawings before the exhibition had even opened. The fact that a foreign newcomer could make so rapid an impression speaks volumes about the turn-of-the-century art market. But it also implies a great deal about the artist's energy and self-assurance. In both his early periods, Picasso was influenced by 19th-century academic approaches, and characteristically reworked art that was currently in vogue or had come back into fashion. 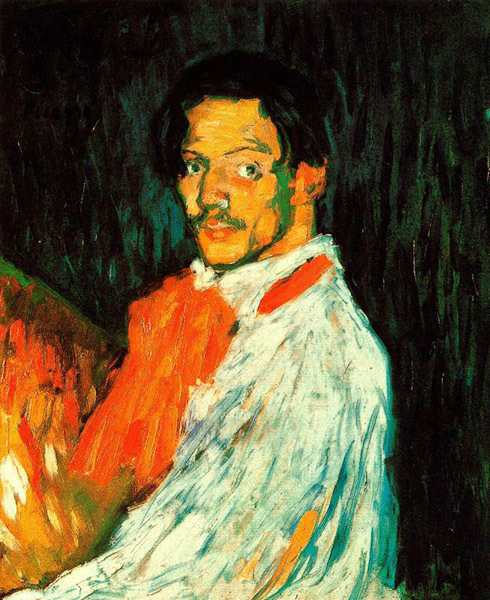 In 1901/02, three years after taking the plunge into the uncertain life of an artist, Picasso established not so much a style of his own as a style that was identifiably his and thus commercially useful. This marked the outset of the Blue and Rose Periods, which lasted till 1906 and have remained the public's favourites to this day. The year 1906 was both a caesura and a transition. Once again Picasso was trying out new forms; and, just as he was achieving recognition, he abandoned the path he had first chosen to take. In the Blue and Rose Periods, form and content had seemed to harmonize. Now Picasso tackled form alone, at a radical level. In the Blue and Rose Periods, stylized forms had been given symbolic values fitting the portrayal of the old and lonely, of the poor and hungry, of beggars. In putting the earlier monochrome approach aside, the colourful world of circus artistes and harlequins in the Rose Period betrayed nothing of Picasso's creative emotion at that date. Melancholy lay draped over the unmerry masquerade like a veil. 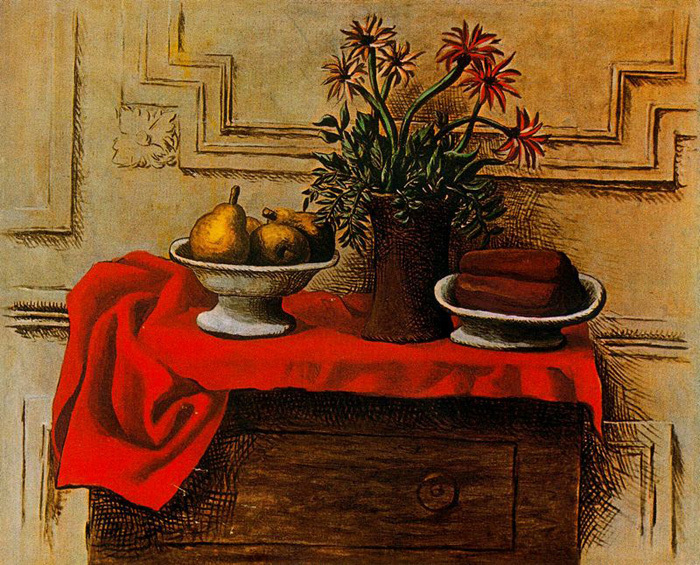 In 1906 warm reddish-brown tones continued to be emphasized, but now spatial forms became Picasso's dominant concern. The new work centred upon heavy objects rendered geometrically, and must be seen as a preliminary phase leading up to the great experiment of 1907. 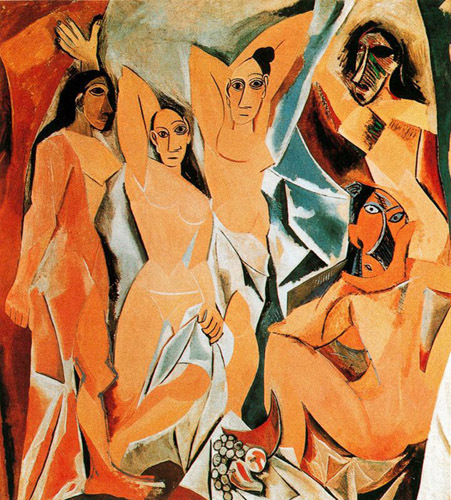 Picasso made his breakthrough in "Les Demoiselles d'Avignon", achieving a new formal idiom and pointing the way for much of Modernist art. Together with Georges Braque, a younger artist, he established Cubism, the first radically new artistic style of the 20th century. 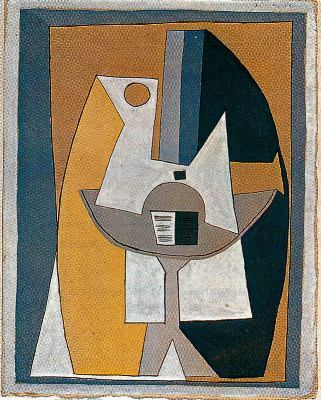 Initially they borrowed the convention of using simplified geometrical forms (hence the name Cubism), arranging them loosely on the surface of the composition without any attempt at unified spatial depth. Around 1910 they moved on to analytical Cubism, in which the spatial and line qualities of the subjects portrayed extend autonomously in parallel and counterpoint across the composition. Pictures thus created look like an agitated juxtaposition of interlocking forms. 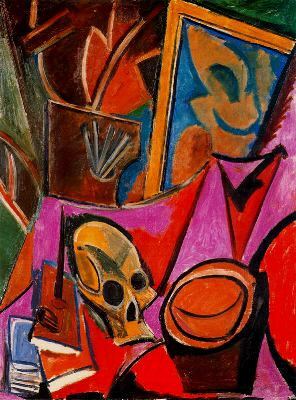 In the third and final phase, post-1912, which was known as synthetic Cubism, Picasso and Braque achived compacted and autonomous structures. Questions of a material or spatial nature became the subjects of their works: using materials that often lay ready to hand, such as newspaper, wood, sand and so forth, they established a new concept of the visual image. 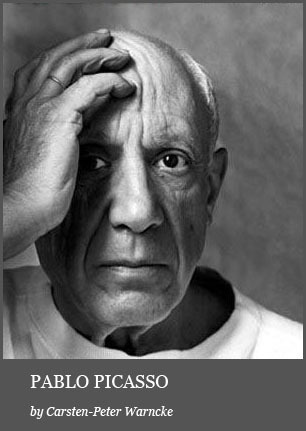 Cubism made Picasso internationally famous and lodged him in the history of art. 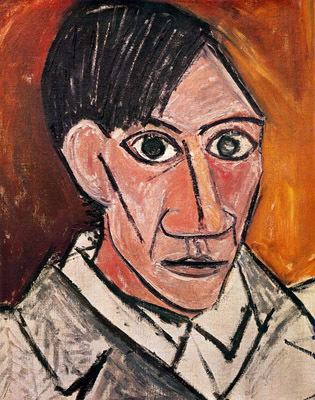 Though he had changed modern art, Picasso himself did not remain in a rut, much to the admiration of his friends, patrons and advocates; and in 1916 he surprised everyone by returning to conventional figural and spatial values, painting stylized, monumental, proportionally random figures that made a classical impression. From about 1924 a lengthy period set in which can best be described as a synthesis of the two formal extremes of his ceuvre to date. The Cubist fracturing of the image was married to clearer, more concentrated spatial zones and linear structures. This movement culminated in his most famous work, "Guernica", painted in 1937 for the rightful republican government in Spain, as a protest against totalitarian warmongering. 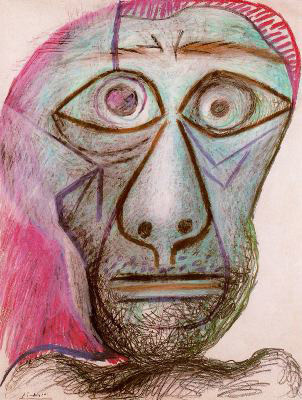 The formal idiom Picasso had now evolved was to remain at the core of his work till his death. 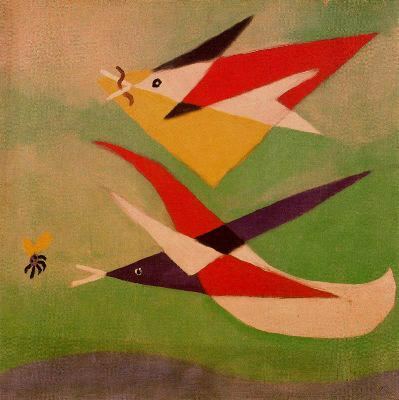 In his later phases he reworked important works by earlier artists, to a greater or lesser extent. He further developed his own methods of three-dimensional work, and branched out into new areas, such as ceramics. To review Picasso's evolution in this way is to present an essentially familiar view of an unarguably major artist. After the years spent learning the craft come the periods of experiment and of gradually locating a personal style. Following an authoritative period of mature mastery comes a late period which essentially plays variations on familiar themes. But if we look more closely at Picasso's case we begin to have our doubts. 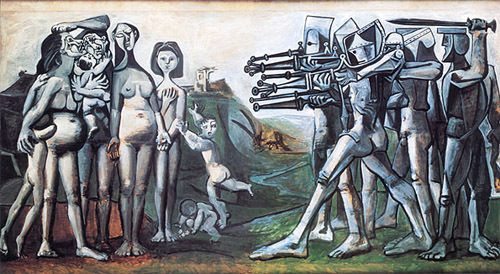 In his so-called classical period, Picasso rendered the human image in monumental fashion; but at the same time he was painting works that continued the line of synthetic Cubism, with all its deconstruction and indeed destruction of that selfsame human image. Surely this is an inconsistency? These different works do still reveal an artist using his own artistic methods with complete assurance. They have that in common. In other cases, though, not even that common ground can be established. 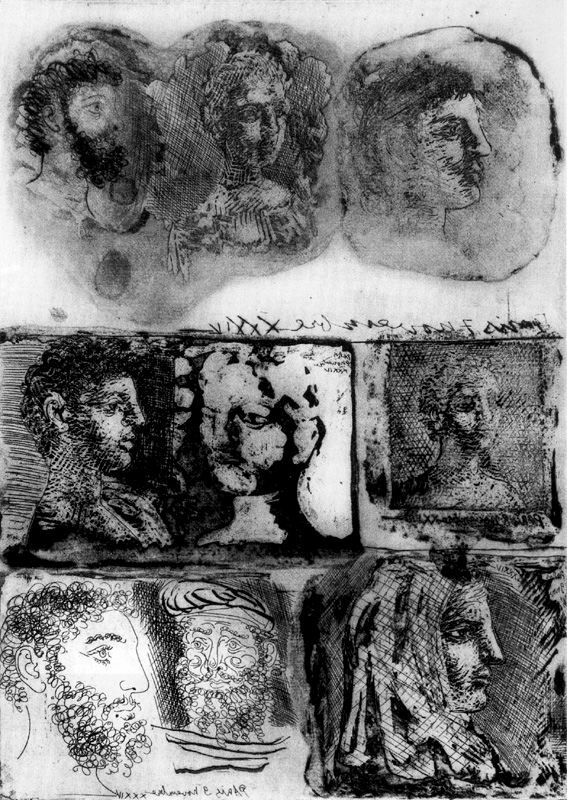 If we look at Picasso's early studies, done while he was being taught, they are clearly the work of a talented pupil. At the age of twelve or thirteen his drawings of plaster-cast figures strikingly had the contoured depth and volume that was required. But the fourth of his sketches done on 1 May 1937 betrays none of this facility. Scrawled outlines sketch an irregular head, neck, rump and legs for the horse. There is little evidence for any well-planned distinction between the essential and unnecessary. All four legs and both eyes, though they would not be visible in a perspective rendering of a side view, are there to be seen. In other words, the drawing seems more a child's drawing than anything else. Yet it would be wrong to draw overhasty conclusions. Picasso, then aged 56, was not entering a premature second childhood: the sketch was one of many that served to prepare his great work "Guernica", done when he was at the height of his powers. This poses a problem. Usual ways of examining an artist's creative characteristics do not allow for the fact that the urge to record a fleeting inspiration may lead him to forget the rules he has long since mastered and to relapse into a pre-training phase. In fact, people generally assume that mastery (and certainly genius) implies absolutely perfect technical command. In Picasso's case there is a discontinuity; indeed, his work is full of discontinuities. For it is far from simple to trace the meaning of his subjects, intentions, and aims. 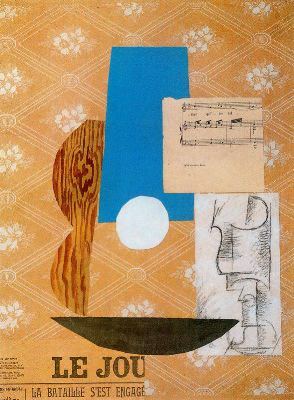 Picasso's Cubist paintings and sculptures, and the late series of variations on Old Master paintings, alike show him aiming at absolute artistic autonomy of means. References to an objective world outside that of the artwork are subsidiary or indeed entirely immaterial. This, it would seem, is the very core of Picasso's art. It is this that made him so famous - and so controversial. This may be true, but equally it is at variance with the facts; for Picasso's art was also, and to at least the same degree, an art of traditional pictorial concerns, from start to finish. We might instance his persistent, even stubborn adherence to the historical painting, a form considered superseded in 20th-century art. 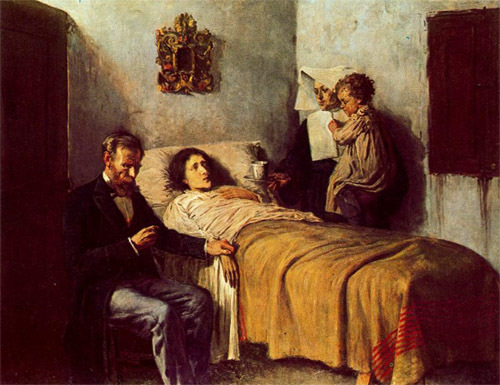 If the sixteen-year-old painted the allegorical "Science and Charity"in 1897, we need only recall prevailing ideas on art in Spain at the time, and the training the young Picasso was receiving. 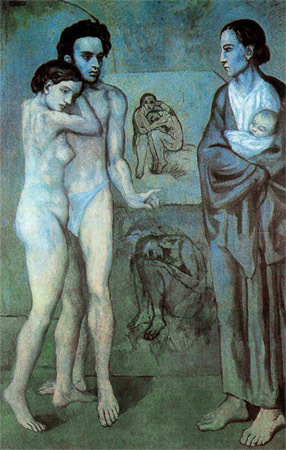 And in 1903, in the most important painting of his Blue Period, "La Vie (Life)", Picasso transformed the suicide of his friend Carlos Casagemas into an allegorical scene: this, if we choose, we can view as a product of strong emotion, a late expression of his training. But "Guernica" too, much later, treats a real event in the form of a symbolic history painting. Similarly in "The Charnel House" and "Massacre in Korea", specific wars in 1945 and 1951, not war as an abstract universal, prompt attempts to deal with exact historical subjects. And historical painting is by no means the only area in which Picasso pursued verifiable subject matter. His interest in formal games-playing was accompanied by an equally strong lifelong interest in certain subjects: painter and model, circus artistes and harlequins, lovers, mother and child, bullfights. His treatment of these subjects persisted as late as the etchings from his final years. But no single, unified, overall picture emerges. Does this imply that Picasso's art was exclusively centred upon himself? That it had no real concerns? This must be disputed. What is true is that conventional methods of analysis cannot gain a purchase on his art. 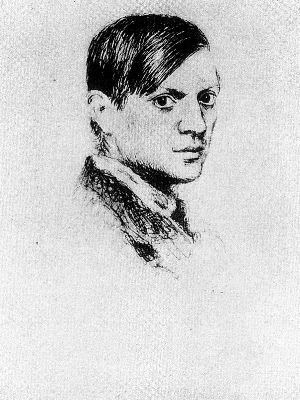 This explains the widely held and oft repeated claim that Picasso was basically a chameleon personality whose true distinguishing quality was that he had no true distinguishing quality - apart from a perfect grasp of artistic means, a childlike lack of conscious intent, an infinite curiosity and interest in experiment, together with a mulish persistence and unusual energy. 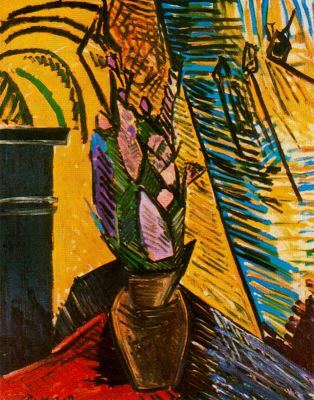 Picasso's style, in this view, consists in his command of every available style. This is too simple. In making Picasso both all and nothing, this interpretation capitulates before any challenge, substitutes anecdotes for analysis, and gives us statistics instead of evaluation. The unusual lifelong devotion implied in Picasso's more-than-lifesize artistic output demands to be taken seriously. 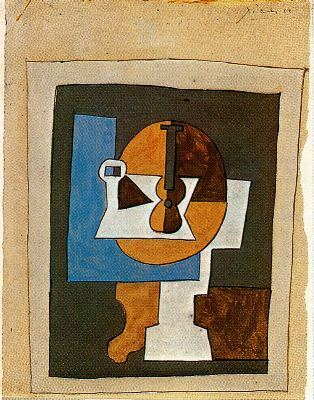 This means looking with a critical eye, seeing the weaknesses along with the strengths, and so making Picasso's real greatness comprehensible. Many works of criticism have been devoted to particular areas of Picasso's creative work, and have extended our understanding in important ways. Every age and every generation, however, will seek a new approach of its own to Picasso's art, will want a Picasso of its own. This book has been written for our own time. It is an attempt to trace a life lived in the service of art, to identify what is universal in the sheer copiousness of the unique.